baby monstaa has stopped by the studio again, this time posing as a holiday elf! pattern and more photos below . . .
is a stripey and pointy hat, knit out of clever camel. 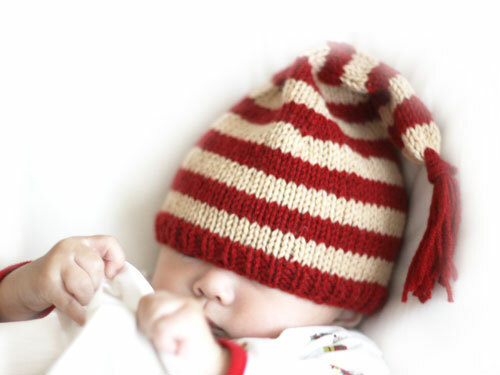 This quick and speedy knit is designed to instantaneously transform baby into santa’s little helper. Round 1: With Poppy, *K1, P1, repeat from * to end. Join to knit in the round, being careful not to twist. Place marker to indicate beginning/end of round. Break yarn leaving a 6 inch tail. Thread yarn onto darning needle, then slip remaining 16 sts onto the darning needle, pull tight and secure into place by weaving in the yarn and/or knotting. Weave in all other loose ends. 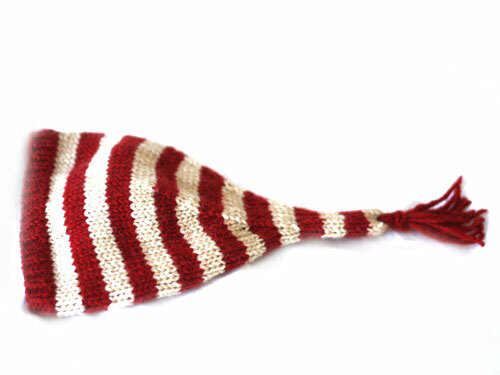 To make the tassel, cut 10 pieces of yarn out of Poppy that are 10″ long each. Thread each of the 10 pieces of yarn through the base of the hat and pull through half way and bend in half. Then, cut another 10″ piece of yarn. Wrap the yarn around 10 prior lengths of yarn several times. Knot to secure in place. Trim ends to finish. Thank you so much for this adorable pattern! I made it for my own baby monstaa, it will be on my blog on Xmas day. 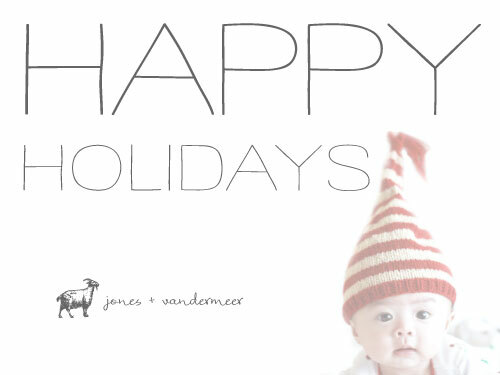 I wish you a great holiday! Pingback: Xmas Elf! | Clairette Tricote, (et autres petites choses avec ses 10 doigts)!